I somehow ended up with three of these! :O I'm quite surprised as well that it took as long as it took for this card to be made, seeing as Russia is the biggest (?) 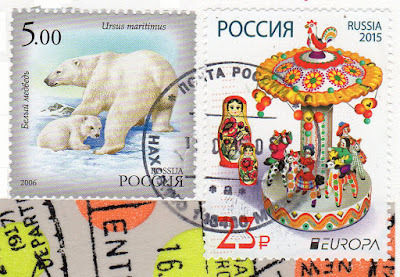 Postcrossing country at the moment, and has been for a while. 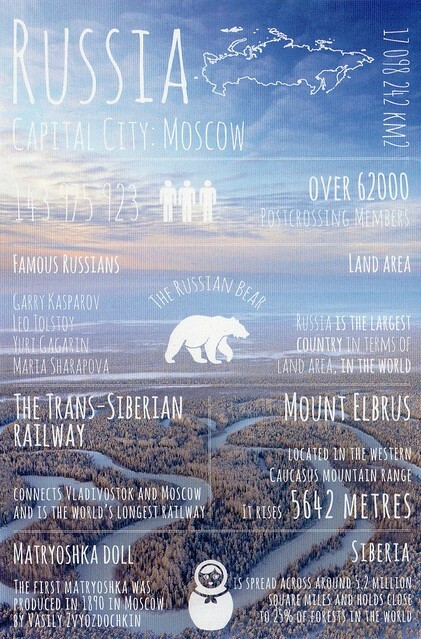 The Trans-Siberian Railway is a network of railways connecting Moscow with the Russian Far East and the Sea of Japan. With a length of 9,289 km, it is the longest railway line in the world. There are connecting branch lines into Mongolia, China and North Korea. It has connected Moscow with Vladivostok since 1916, and is still being expanded. It was built from 1891 to 1916 under the supervision of Russian government ministers who were personally appointed by Tsar Alexander III and by his son, Tsar Nicholas II. Even before it had been completed, it attracted travellers who wrote of their adventures.